We are starting our week long feature on storage and organization talking about inks. I will admit it upfront, I have an issue with inks! I LOVE inks! Below you will see the wall of ink on my stamping desk. 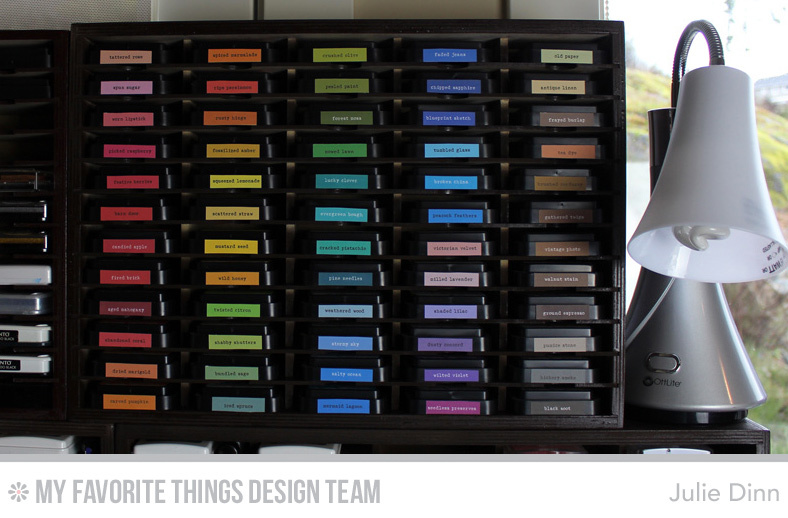 My ink pads are housed in a number of different ink pad holders from Stamp-n-Storage. The majority of my inks are from My Favorite Things. They are all separated by the different styles, Premium Dye, Hybrid, and Pigment. These inks are all in the Standard Ink Pad holders. I am able to fit the ink refills in the same slot as the ink pad. I love having the refill right next to the ink pad. As you can see, the ink refills have a small dot of coordinating card stock on the lid. I stole this idea from Jodi and Barbara after last years organization feature. I used a 3/16" circle punch to cut the circles, I adhered them to the bottles with a glue dot. My Stampin' Up! 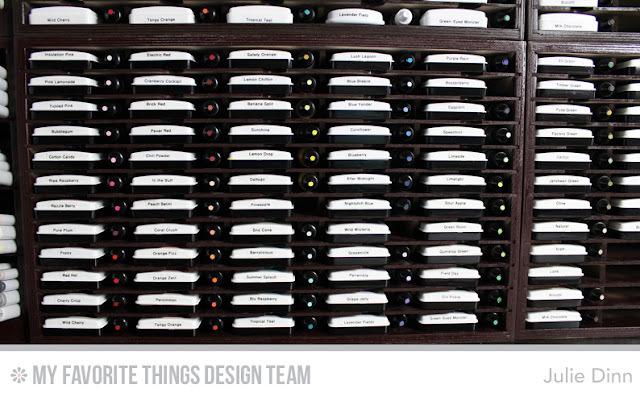 Inks are housed in Expedit ink pad holders that were designed to fit in the Ikea Expedit Units. 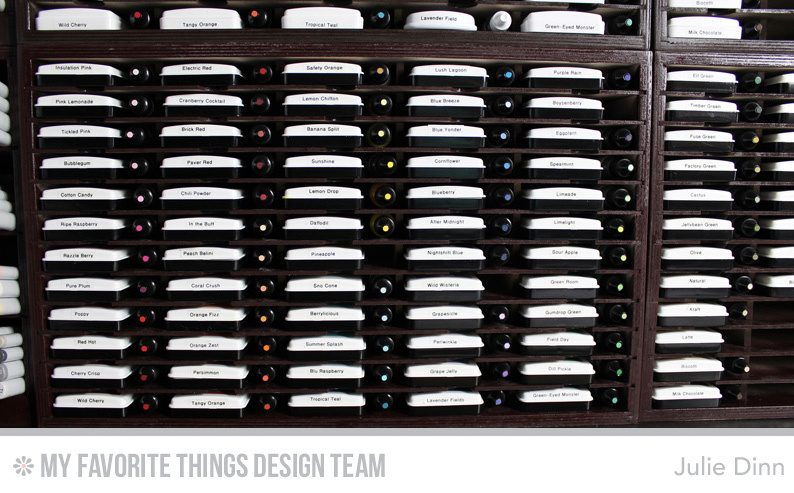 I used to have these holders in the Expedit unit but I have since moved them over to the wall of ink. The other type of inks that I collect are Distress Inks. These are all housed in the Petite Ink Pad holder which is also from Stamp-n-Storage. My wall of ink also includes my markers. 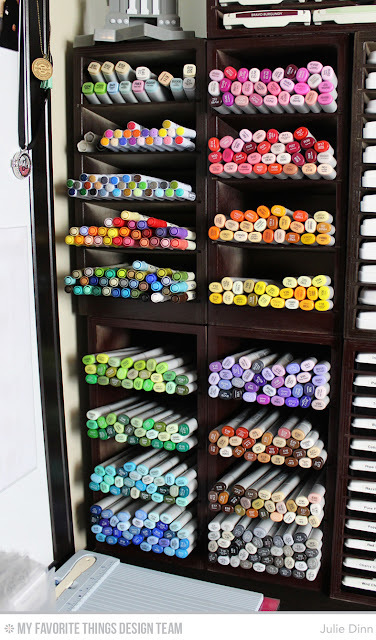 I store my Copics, Zig Markers, and my Tim Holtz Watercolor Markers in Marker Nook Units. 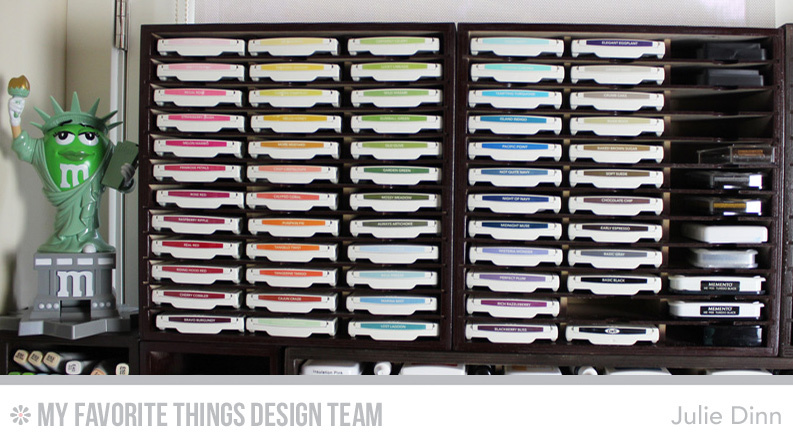 Be sure to check out the MFT Blog to see how the rest of the team organizes their stamping space. I'll be back tomorrow with some stamp set organization. 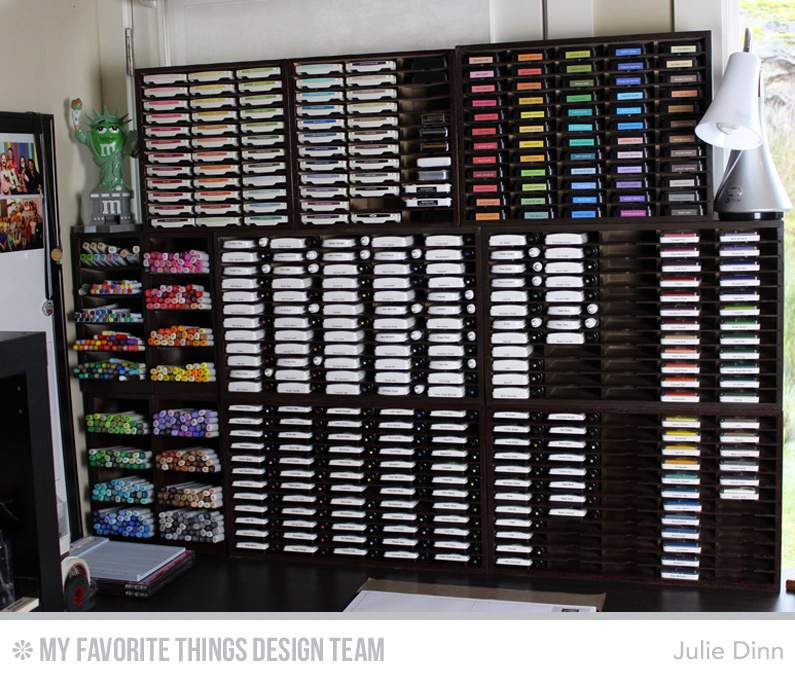 I'm drooling over your storage ideas. I have lots of ink, not all of it in one place like this, but the ones I use the most are on my desk. No such thing as too much ink, right? I love the idea of the small color circles added to the reinker bottles. So smart! Thanks for sharing. Love those storage units!! 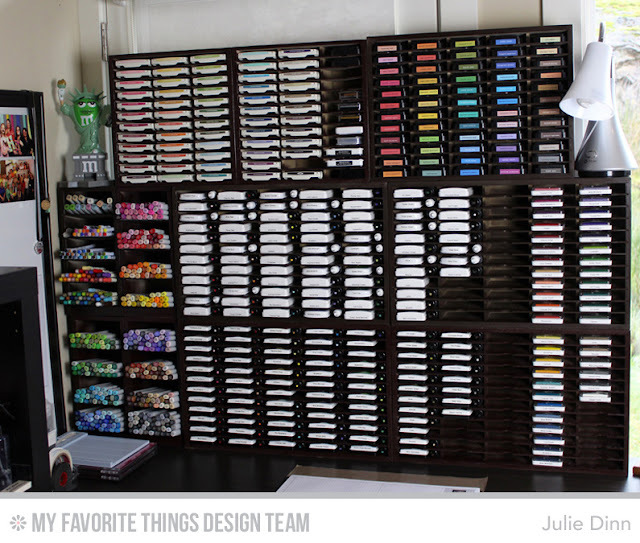 And oh my that is a lot of ink =) tfs! All the colors are so pretty, the organizational units look great! May I ask if you printed off the Distress Ink labels? I'd love to have mine in color!! !